Rack Stack and Roll will transform your life. Do you have a space that is in desperate need of better organization? Need more storage space? Order one of our durable Personal Valet clothing racks today and let it do the work! The Personal Valet's revolutionary S-shape can hold up to 50 garments! Its stainless steel frame is stackable and industrial grade to withstand the test of time. The wheeled base allows for easy transport. Our products are made in the U.S.A. and 100% guaranteed. Fashion Industry Basements And much more! 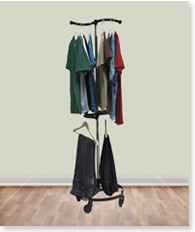 Give the gift of organization this year with one of our revolutionary clothing and storage racks! Follow Us! Be sure to like us on Facebook and follow us on Twitter for all of the latest RSR news. Check out what The Daily Buzz is saying!